Albumen silver print, mounted imperial card with grey faux wood finish. Card measures 13.5” x 11.75”. Date of ca.1890 based on mount style. The Merlin Grotto (MOVPER) bugle corps posed on a stone-paved street with drums and swords (but no bugles visible). Thirty four men, all in fancy “Arabian Nights” style costume, except for one, kneeling in front in light suit. All wear grotto member fezzes. Front and center, a man holds a banner, ornately cut and embroidered, reading “MERLIN GROTTO” across the upper section, and then “NO. 63 MOV PER SAGINAW MICH.” variously on the lower section, which also features a veiled Mokanna head. As a legend encircling the lower part of the Mokanna, there is additional 7-character text (?) possibly in cipher. Two bass drums are also decorated with the same information as the banner. Lower right, a photographer’s reference number: 6583. 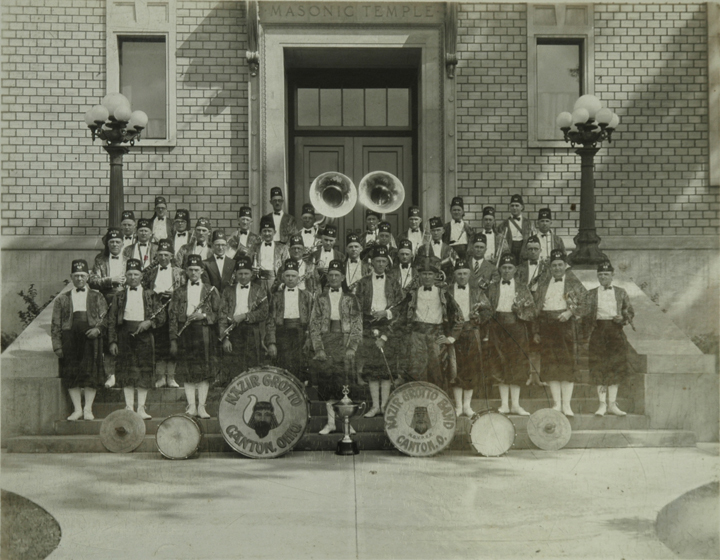 Gelatin silver print, group portrait of Nazir Grotto band, posed on the steps of the Canton, OH Masonic Temple (location photographically verifiable). Roughly 40 men in fancy “Persian” band uniforms, including pantaloons, short jackets with embroidery, and Nazir Grotto fezzes, posed on the steps of the Temple. Standing at the smaller bass drum is the apparent drum major, in longer jacket and a turban. 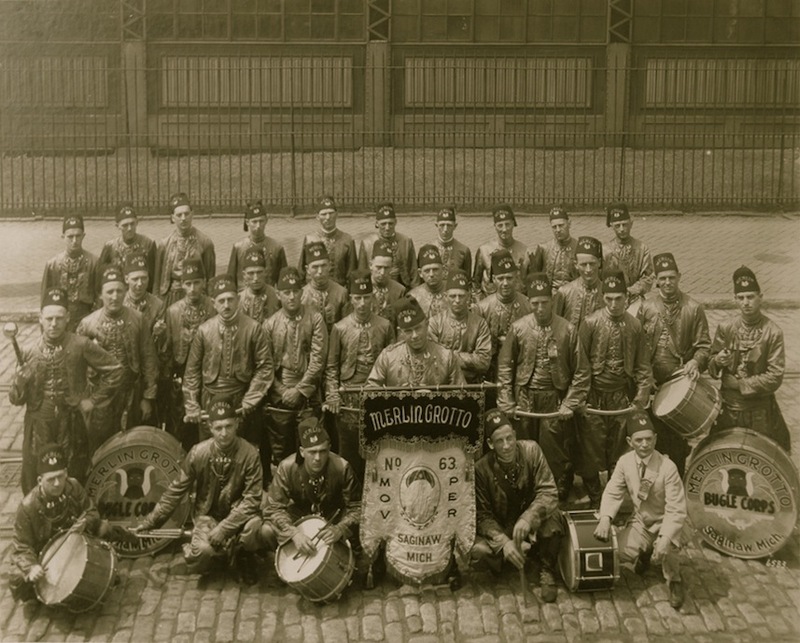 Arrayed in front of the band members are cymbals and drums, the to largest of which bear the Mokanna head and read “NAZIR GROTTO / CANTON, OHIO” and “NAZIR GROTTO BAND / MOVPER / CANTON. O” respectively. The card mount of this photo has been hacked down, the top and bottom inch or so each cut off, probably to fit in a frame at some point. This has also destroyed the photographer’s stamp, only part of which is still visible, recto LR. 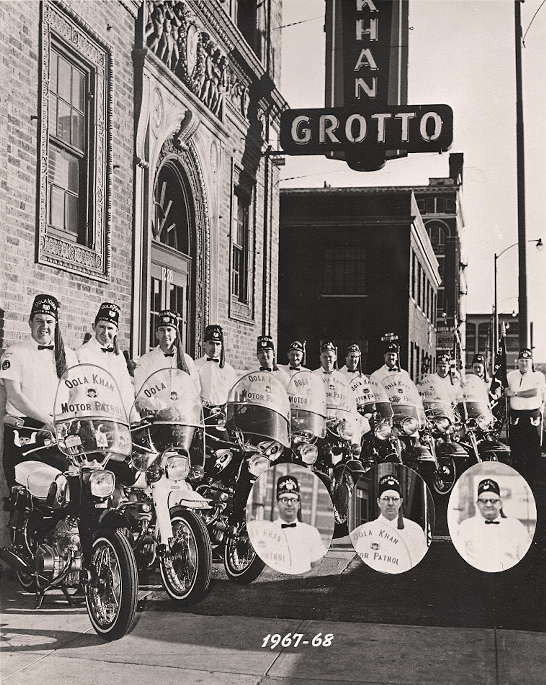 Gelatin silver print with matte finish of the Oola Khan Grotto Motor Patrol, MOVPER, Cincinnati, OH. 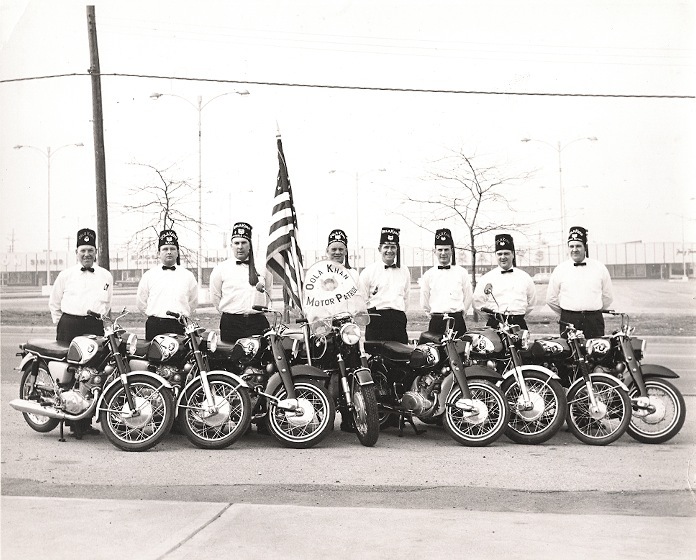 Bike in center has a windshield emblazoned with a Mokanna head, and reads “OOLA KHAN MOTOR PATROL” and there is an American flag on a staff, either mounted or leaning against it. Group portrait of twelve men and nine motorcycles, lined up outside the Oola Khan Grotto, the lage neon sign of which can be seen UC. An additional three men posed with bikes lined up in vignettes along LR. The men all wear dark trousers, long sleeved white shirts or short sleeved white shirts with a patch on the arm, and Grotto fezzes. Several wear bowties. Some of the cyclists’ fezzes are noted with other unit names on them, as well, several reading “Motor Patrol”, but at least one other reading “Band” and some being illegible. Each of the motorcycles has a windshield decorated with a Mokanna head and reading “OOLA KHAN MOTOR PATROL”. Far right, a man holds a MOVPER banner on a staff. Lower center, the photographer has noted “1967-68” into the negative. I found a crystal jar with a brass top. On the brass top are the letters, M.O.V.P.E.R 44, Brooklyn, NY. There is a a nordic/Egyptian? figure on it–says “Long” at the top? Do you know what this is? jlsrgs@yahoo.com. My name is Bob. Thank yoi. I can’t say what the jar is, itself, probably exactly what it seems like—a nice jar with a canister lid. The design is from the Mystic Order of Veiled Prophets in the Enchanted Realm (MOVPER), the local unit of which is called a “Grotto.” The emblem is the head of the Prophet Mokanna (or al-Muqanna’), around whose fable the MOVPER ritual is structured. The Mokanna head is often mis-understood to be a Viking head; but in fact, the two “horned” shapes are the folds of the prophet’s veil as it is pulled back to reveal his face. As for “Long” and “44,” these are almost certainly at least part of the name of the particular Grotto for which the object was made as a trinket, gift, or keepsake. Each Grotto has a name and a number (or at least they used to have a number, you don’t see the numbers used much anymore). I’m having trouble finding a complete historical list of Grottoes at the moment, but I’m certain that that is what the word and number are. You got a picture? I’d love to see it! Grotto pieces aren’t super rare, but they are on the less-common side, and your jar sounds pretty neat! Could it have been Long I which is actually a Long Island Grotto which currently is not in active status?